The concept combines NFC tags placed at strategic points around a building, GPS and a downloadable layout app to guide visitors all the way from their home or office to a particular room, aisle or store. Scientists at a university in Turkey are developing a low-cost, user-friendly indoor navigation system based on NFC technology. The team at the NFC Lab in Istanbul’s Isik University has produced a paper outlining how ‘NFC Internal’ can overcome the limitations of GPS navigation systems, which work poorly inside buildings because they need a ‘line of sight’ to the satellites which drive the system. 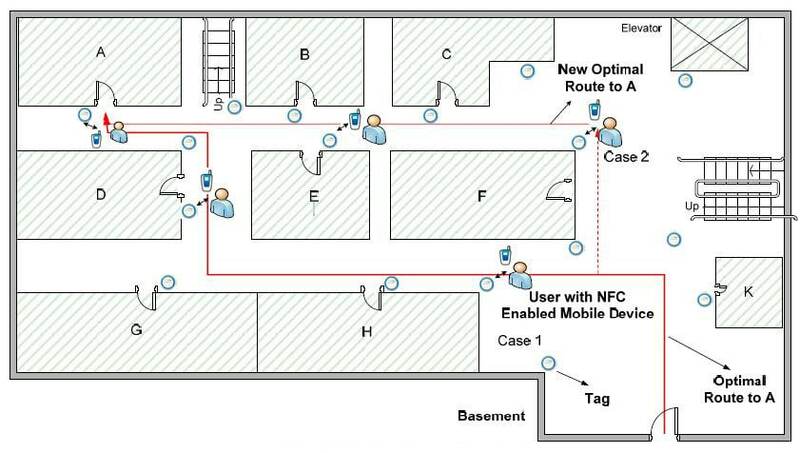 Through a series of NFC tags placed at strategic points around a building or complex, visitors using their NFC-enabled phone with an embedded indoor navigation application can easily find their way around an unfamiliar indoor environment. On entering a building, the visitor checks in by tapping their phone to an entry tag and inputs details of the location within the building they want to get to, for example a room number. A layout of the building is then downloaded to the NFC Internal app on the visitor’s phone and this then also calculates the best way to get to their destination — in much the same way as an outdoor satellite navigation system would. Tags placed around the building can then be used by the visitor to monitor their progress and reorientate themselves if they get lost. A touch of a tag provides the app with the user’s current location, and new directions can be calculated if necessary. The system could also be integrated with a phone’s internal GPS facility, allowing users to plot their route to a specific point in a building from any location. And, as well as office buildings, the system could also be used to help shoppers find the location of a particular item within a supermarket, a particular store within a mall, a stand within an exhibition centre or a consulting room in a hospital. Maintaining user privacy. NFC Internal does not need a server or a terminal to orient position, so the location of the user is not tracked. Providing exclusive control over location data for the user. The full research paper, by Busra Ozdenizci, Kerem Ok, Vedat Coskun and Mehmet N Aydin, can be downloaded in PDF format from the NFC Lab’s website.